Great Dane! Missing socks mystery solved! Oregon Great Dane pooch ate 43-1/2 socks and wins prize in national veterinary contest! I’ve spent many an hour at Dove Lewis, Portland’s emergency animal hospital. For example, a few years ago, we came home to find our Bullmastiff foaming at the mouth with labored breathing. He was in a bad way. We whisked Max off to Dove Lewis where we learned he’d eaten a supposedly ‘safe’ version of a nylabone. It turns out, swallowing an entire bone without chewing will cost you $3,000.00 to get loosed from a sphincter. There’s your pro tip for the day. My Maxie died from cancer a few years later. He was good boy, a rescue, who would wake from a dead sleep at the sound of a hard boiled egg cracking on the counter. He was a world class beggar and totally devoted to his mama (there might be a connection there, but I’ll never admit it). Fond memories my red-fawn colored boy came back today when I heard about the record breaking sock eater. 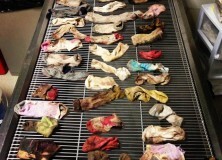 Last February, Dove Lewis surgically removed 43-1/2 socks from the gut of a Portland area Great Dane. At first I was stunned to learn there was another animal dumb enough to swallow without chewing, but memories of a recent trip to the mall food court put that concern into context. The dog, whose name has been kept secret because somebody might think its that Bella, is doing well now. I wonder if they ever entered Maxie in that contest.